I don’t make it out to Aubree’s Pizza and Tavern on Whittaker Rd. in Ypsilanti very often, partly because even though their pizza is good, it’s a bit pricey. However, after I received my annual “free large specialty pizza” coupon for my birthday the other week it was an easy decision to go. I ordered a house salad to start because their breadsticks in the past have come out hollow inside. 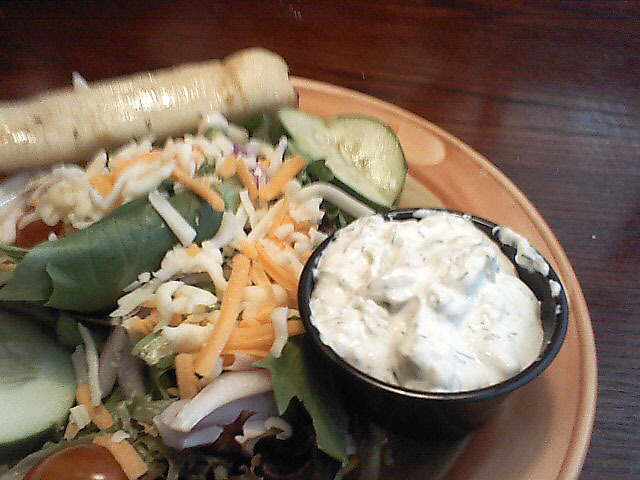 I asked for a side of their creamy cucumber dill dressing. The dressing was incredibly thick, almost dip-like, but was a nice change from the standard dressing choices. I might suggest a little more buttermilk to thin it out a bit. The salad itself was a fresh mix of field greens, grape tomatoes, cucumbers, red onions and shredded cheddar and went well with the flavors in the dressing. We ordered a deep dish BBQ Chicken pizza, minus the red onions. As always, it was really good. 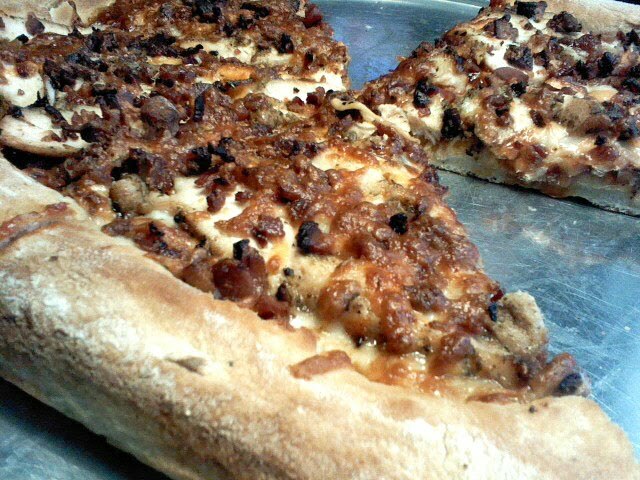 They use a sweet local barbecue sauce, Frog Island, in place of tomato sauce and top it with grilled chicken, lots of bacon and a four-cheese blend. The chicken somehow stays moist and there’s plenty of crisp bacon to satisfy any meat-lover. I’d order it more often, but it would probably clog my arteries if I ate it regularly. Plus, at $16.99 for a large it puts a bit of a strain on my wallet when it’s not “free”. The Whittaker Rd. location has a more sophisticated and upscale feel than the one in Depot Town which is more of a college kid destination. The staff is efficient and pleasant. On a past visit we had problem resolved by the general manager in a very professional and friendly manner. If you haven’t already, you should stop in for a change of pace from the Depot Town location. Also, make sure to sign up for their email list to get a free pizza during the week of your birthday (dine-in only). Writing about pizza on a food blog may seem a little low-brow, but this is very well deserved. Pizza Perfect in Ypsilanti on S. Ford Blvd. is fantastic. They don’t sell gourmet pizza, but they serve excellent quality food and consistently give outstanding service. 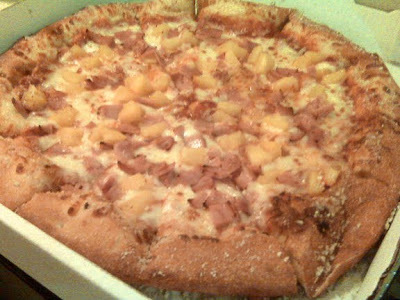 I have a standard order of ham and pineapple with butter cheese crust and mozzarella bread. The service is always friendly and efficient, the estimated pick up time is always accurate and the food is always perfectly cooked and just as it was ordered. I grew up in Farmington Hills near the Papa Ramono’s chain; I consider Pizza Perfect to be the Papa Ramano’s of Ypsilanti. The crust is crisp on the outside, soft and chewy inside and you can really taste the flavor. 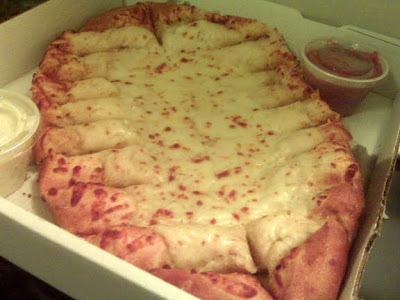 The cheese is gooey and the toppings are plentiful. The portion sizes of the pizza and bread for the price are generous. For a large 2-topping pizza, a large order of mozzarella bread with ranch and marinara, and a 2-liter of pop it will run you a little over $13 for carryout. The staff is always friendly when you arrive for your order. The food is always ready to go and they always thank you for your business and hold the door for you on the way out. It’s rare these days to find a business that really shows how much they value their customers, but Pizza Perfect is an exception. Maybe it’s because they’re in a less desirable part of town and want to make sure their customers come back, but I think it really comes down to their love of the business and genuine love of people. Pizza Perfect may be a bit off the normal route, but I highly recommend trying it. It’s a rare combination to get both quality food and service when ordering pizza on a Friday night. Beezy’s Cafe in Ypsilanti has become one of my favorite breakfast places. The staff is lively and welcoming, the food is top notch and uses local ingredients and the small atmosphere is cozy. As the woman behind the counter last Saturday put it to the customer ahead of us, “We don’t just have great food and great service, we have great advice for our customers.” I overheard her giving the customer a little “advice on life” in addition to his order. That’s the kind of place I like going back to, an eatery that is not just about the food, but about their customers and creating an experience. I had the special baked French toast when I was in last. It smelled and looked so good I forgot to take the pictures until halfway through breakfast. It was a Peanut Butter Baked French Toast with house-made Blueberry “Jam”. To be honest, I’m not much of a blueberry fan, but the jam was less jam and a little more like a blueberry compote and was a perfect compliment to the peanut butter. The fruitiness of the “jam” cut through the richness of the peanut butter to make for a delicious experience. I also loved the streusel-like topping of oats and brown sugar. I’m sure the fat and calorie count didn’t fit into my normal healthy choices, but Beezy’s is great for a splurge. My husband had his usual Breakfast Burrito, sans the salsa fresca, and loved it as always. The tortilla is stuffed with scrambled egg, fresh chorizo sausage and cheddar. I’m not a fan of eggs, Cafe Marie’s braised eggs are the only exception, so you’ll have to decide on this one for yourself. The only downfall of Beezy’s I can see are the hot beverages. I’ve been disappointed with the espresso drinks, Chai and hot chocolate; all lacking flavor. But, don’t let that deter you from great food and service. If you overlook that the lack-luster beverages you’ll enjoy a fantastic breakfast and bubbly personalities in downtown Ypsi.